There are still no effective means to control Dutch elm disease (DED), caused by the vascular fungi Ophiostoma ulmi and O. novo-ulmi. 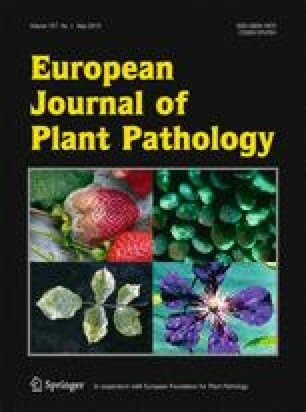 Plant phenolics may provide a new strategy for DED control, given their known antifungal activity against pathogens and their involvement in plant defence mechanisms. The in vitro antifungal activity of salicylic acid, carvacrol, thymol, phenol, o-cresol, m-cresol, p-cresol, and 2,5-xylenol against the DED pathogens was tested. Also, the protective effect of watering Ulmus minor seedlings with these compounds was tested against O. novo-ulmi. Salicylic acid, carvacrol, and thymol showed the strongest antifungal in vitro activity, while carvacrol and salicylic acid provided the strongest in vivo protection against O. novo-ulmi (63 and 46% reduction of leaf wilting symptoms with respect to controls, respectively). The effect of the treatments on tree phenology was low, and a significant negative relation was observed between the number of days to bud burst and the leaf wilting symptoms after inoculation, probably determined by genetic differences among the elm tree progenies used. The treatments with salicylic acid, carvacrol and thymol induced the highest shift in phenolic metabolite profile with respect to control trees. The protective effect of carvacrol and salicylic acid is discussed in terms of their combined activity as antifungal compounds and as inductors of tree defence responses. The authors are very grateful to Dr. R. Raposo (INIA-CIFOR) for making suggestions for the in vitro experiment, and to M. Burón and M. A. García (Universidad Politécnica de Madrid) for their technical assistance. This work was supported by the research project INIA RTA05-151 and by an agreement established between DGMN (Ministerio de Medio Ambiente y Medio Rural y Marino) and ETSI de Montes in Madrid.